Historic Casa Loma is one of the largest castles in North America and was once the largest residence in Canada at more than 64,000 square feet. Built in 1914 by financier Sir Henry Mill Pellatt (1859-1939), the castle has become one of the towering symbols of Toronto’s illustrious past. 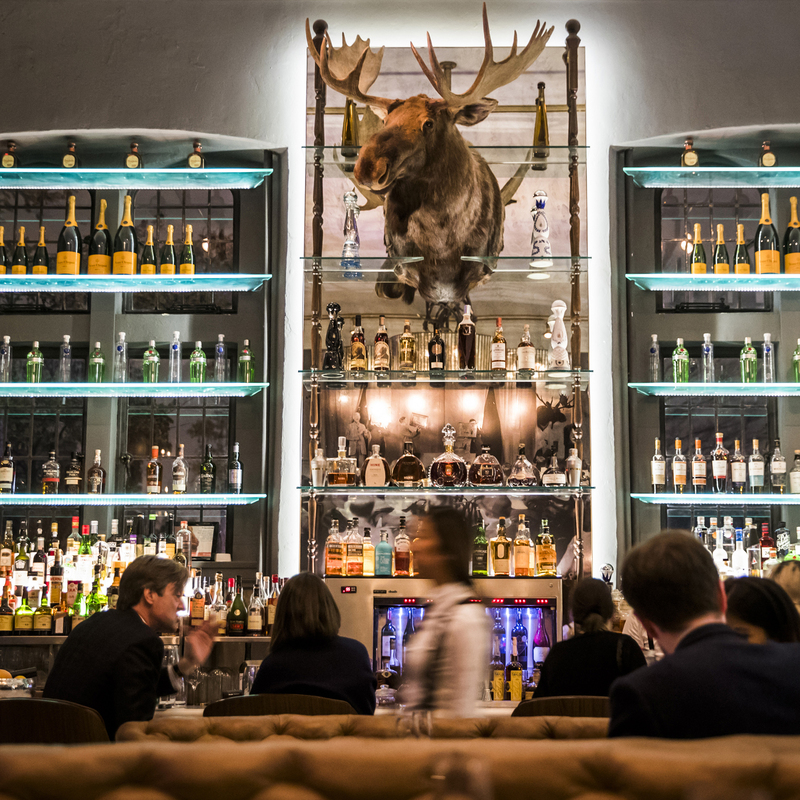 In 2014, Liberty Entertainment Group transformed Toronto’s historic castle into a vibrant complex featuring prolific cultural and private events, and in 2017 launched the groundbreaking BlueBlood Steakhouse. 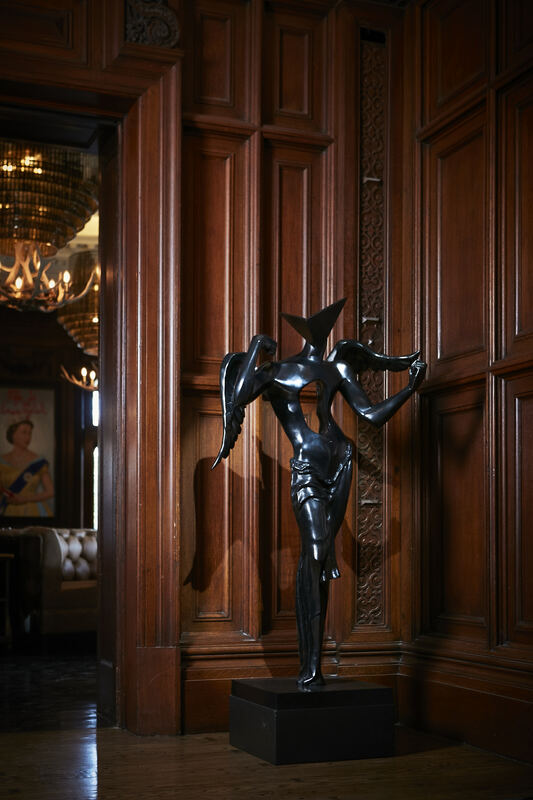 Early on, Robin Rile Fine Art was enlisted to curate original fine art for the castle itself as well and the new restaurant venue. To this end, working with Nick Di Donato and Creative Director and VP, Nadia Di Donato, Robin Rile Fine Art consulted history books and compiled lists of the original artworks included in Sir Pellatt’s groundbreaking original collections, ephemera in his décor, automobiles in his garage, as well as envisioning what he might include in a modern, cutting edge dining area. 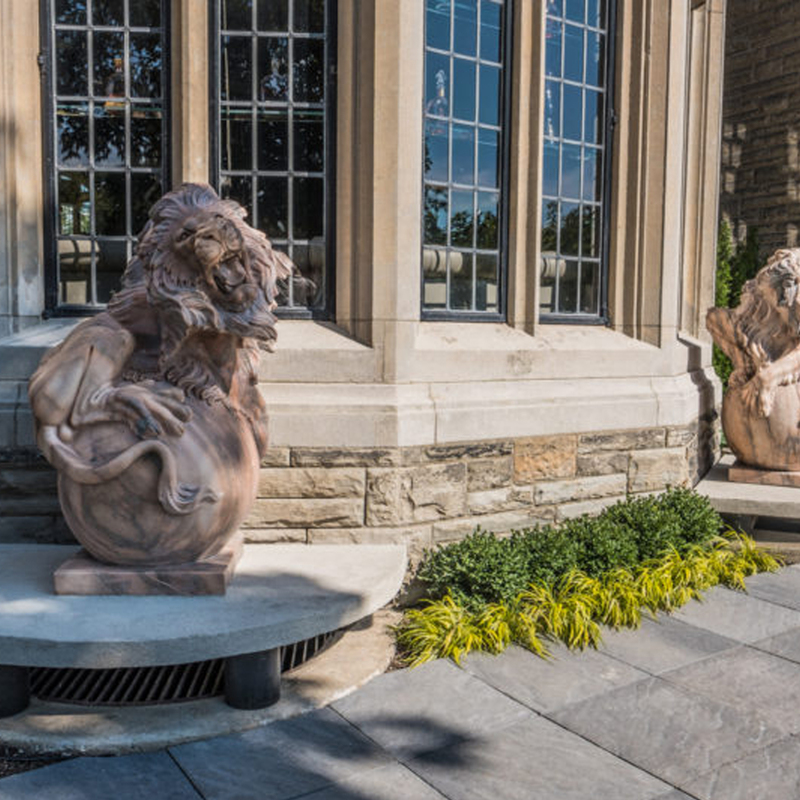 As in historic tradition representing honour and respect, two lions regally flank the exterior entrance to BlueBlood Steakhouse. 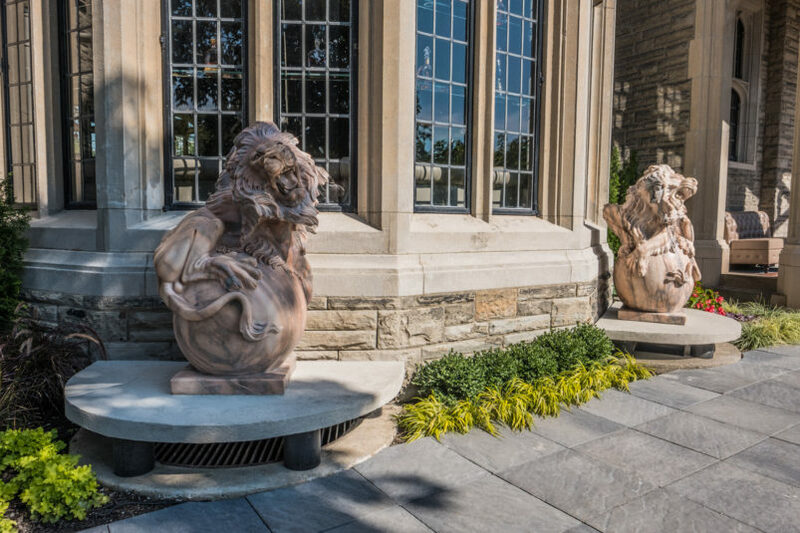 These rose marble lions (c. 1920’s) were carved from single blocks cut from the same Portuguese quarry which yielded the marble for the Casa Loma Conservatory floor. The entryway boasts book matched slabs of Calcutta Marble imported from Italy with a natural break, revealing the laser engraved BlueBlood crest. The term “Blue Blood” actually refers to the nobility of Europe appearing to have “blue blood” under their skins. Fittingly, Street art Icon Mr. Brainwash’s (A.K.A. 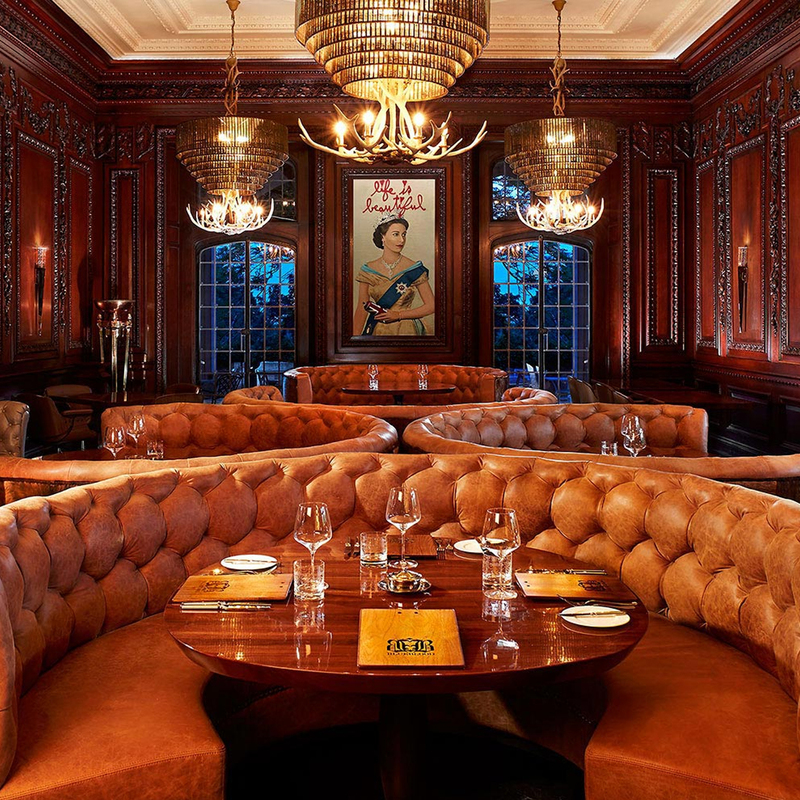 Thierry Guetta) “QE2” featuring a young Queen Elizabeth II, presides over the Great Oak Room of BlueBlood Steakhouse. Commissioned specifically for installation in BlueBlood, she holds a spray can as a wink-and-nod to both classical and modern sensibilities. Mr. Brainwash’s quintessential “Life Is Beautiful” has become a hallmark for all of Liberty Entertainment Group’s venues and is echoed above Queen Elizabeth II’s royal crown. For every Queen, there must be a “Prince”. Much of the reverence traditionally held for royalty is today encapsulated by our admiration of celebrity. Rock Stars have become our “Blue Bloods”. With Canada’s position as a quintessential melting pot of cultures mixing blood both red and royal blue, Street Artist Mr. Brainwash’s, “Purple Reign” (a play on Prince’s “Purple Rain”). 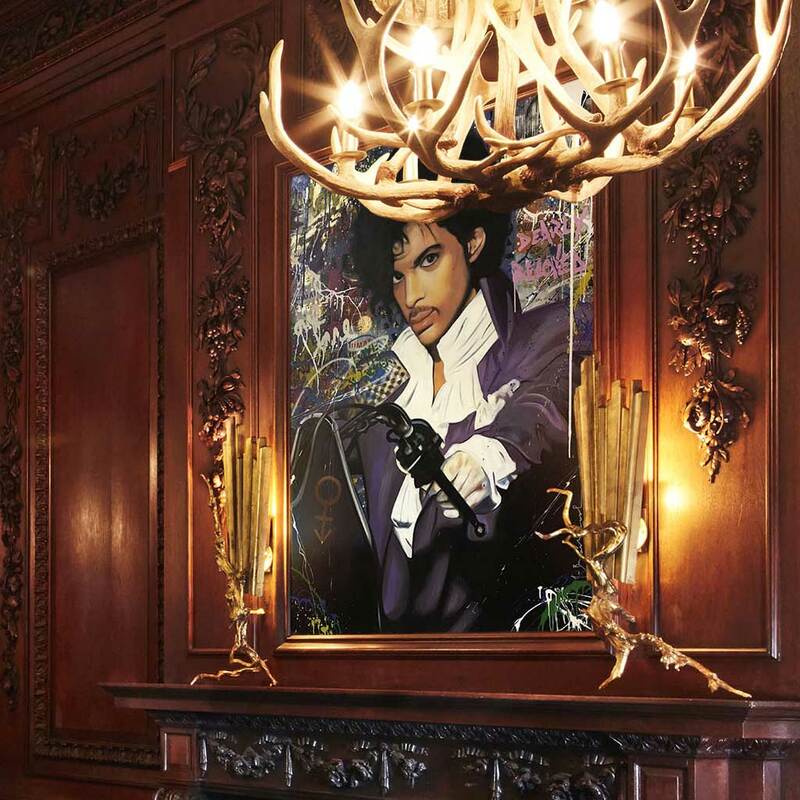 Mr. Brainwash’s first depiction of the recently departed music Icon Prince (1958-2016) and was commissioned specifically for its placement in BlueBlood. 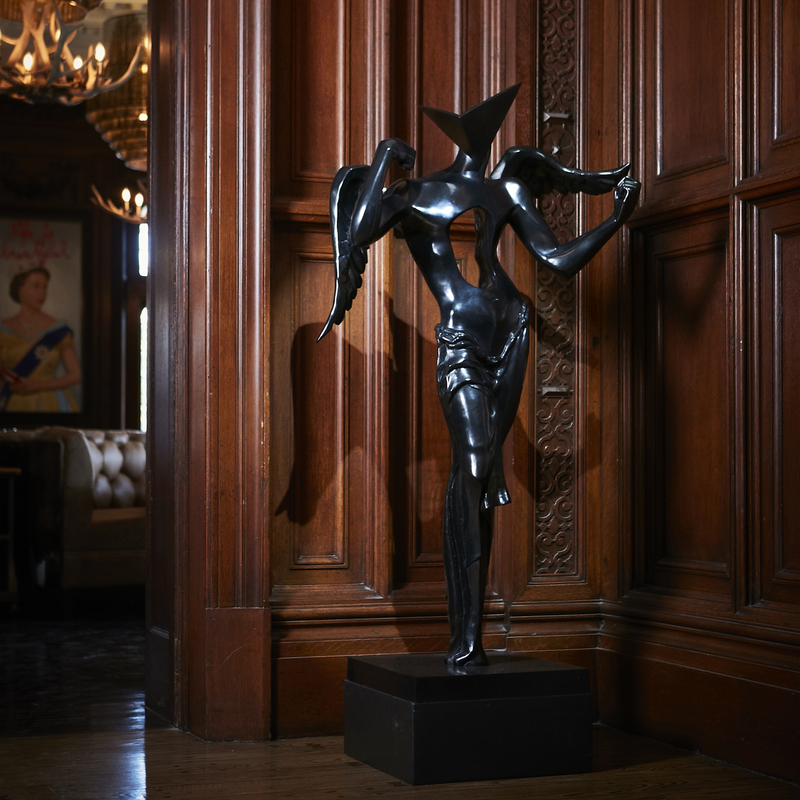 Spanish master Salvador Dali’s (1904-1989) enigmatic “Surrealist Angel” (monumental-scale bronze, EA#4/4) remains one of the most revered and mysterious 20th Century masters. His over-the-top personality and his vast knowledge of subjects as diverse as complex mathematics and science, spiritual and psychological dogma and the broad spectrum of Art History, make him one of the Blue Bloods of Art. Dali bases his “Angel” on the 3rd century Greek Icon “Winged Victory/Nike of Samothrace” (Musée du Louvre) providing a glimpse into what he felt his own “Nike” was meant to symbolize, the sounding of the trumpets of Victory. BlueBlood Steakhouse at Casa Loma in Toronto, Thursday November 9, 2017. 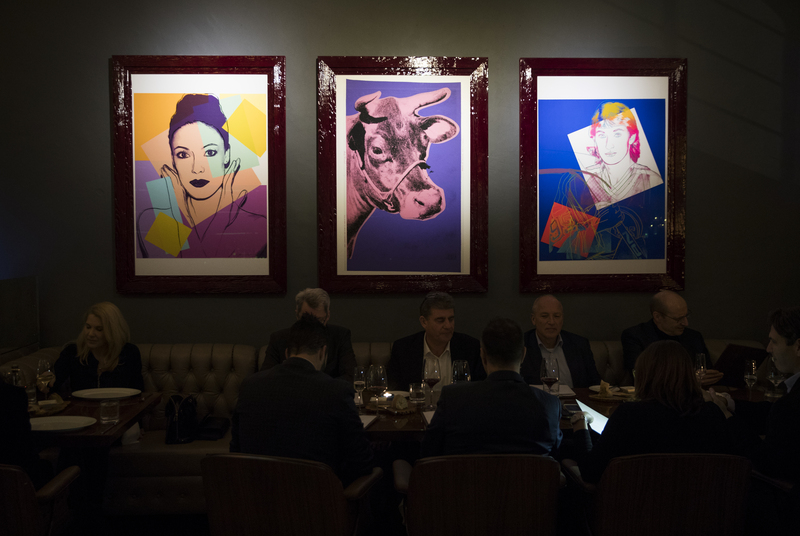 Photo By Mark Blinch[/caption]No steakhouse would be complete without a “Cow”, and Pop Art Icon Andy Warhol’s “Cow” adorns the Sitting Room. This work is flanked on the left by Warhol’s depiction of Toronto-native and legendary ballerina Karen Kain who personally signed this print for BlueBlood, making it truly unique. To the right is Ontario-native Wayne Gretzky whose transcendent hockey prowess earned him the title “The Great One”, 1979-1999. These two images were the only Canadian icons ever painted by Warhol. Culminating BlueBlood’s Andy Warhol collection is “Indian Head Nickel” from his “Cowboys & Indians” Portfolio. 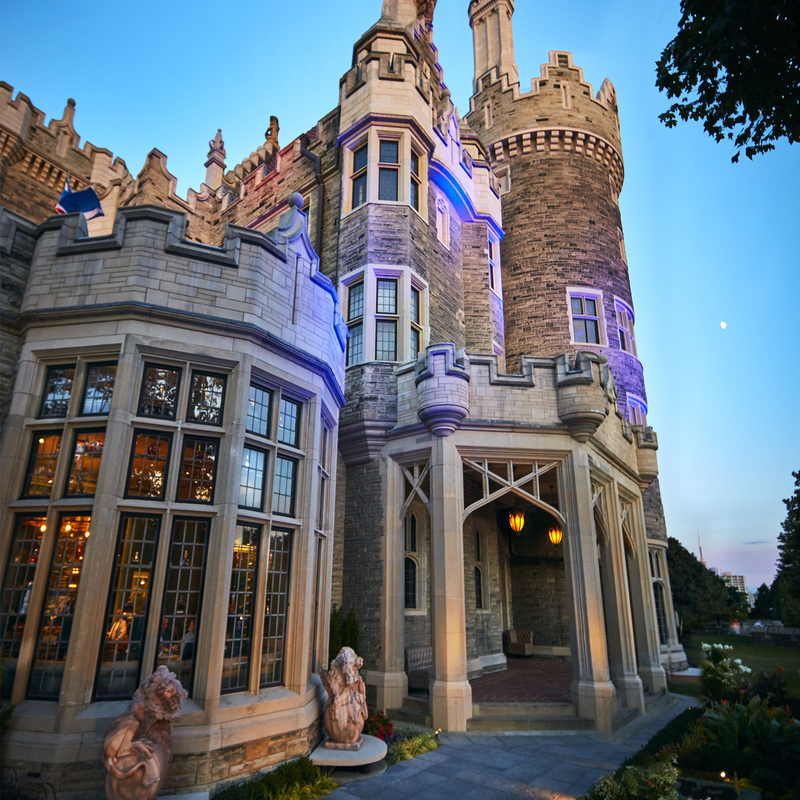 The “Liberty Nickel” echoes sentiments personal to the Liberty Group, both in its name and its 1913 date which marks the year Casa Loma was constructed. The entryway boasts book matched slabs of Calcutta Marble imported from Italy with a natural break, revealing the laser engraved BlueBlood crest. The term “Blue Blood” actually refers to the nobility of Europe appearing to have “blue blood” under their skins. Fittingly, Street art Icon Mr. Brainwash’s (A.K.A. 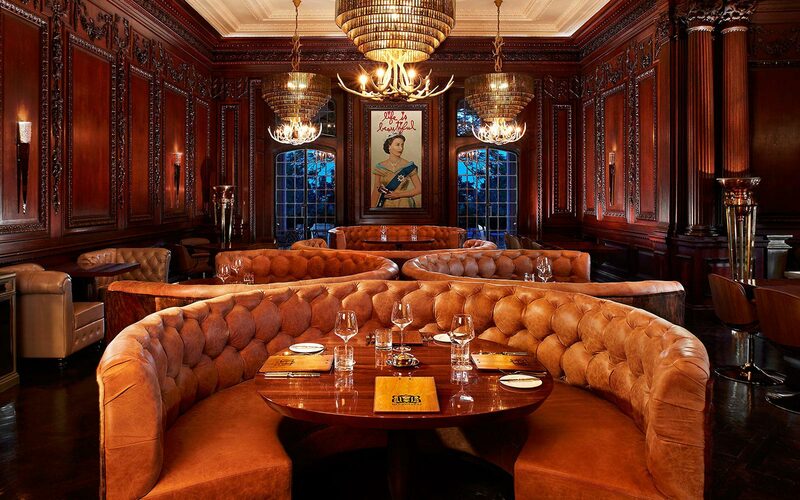 Thierry Guetta) “QE2” featuring a young Queen Elizabeth II, presides over the Great Oak Room of BlueBlood Steakhouse. Commissioned specifically for installation in BlueBlood, she holds a spray can as a wink-and-nod to both classical and modern sensibilities. Mr. Brainwash’s quintessential “Life Is Beautiful” has become a hallmark for all of Liberty Entertainment Group’s venues and is echoed above Queen Elizabeth II’s royal crown. 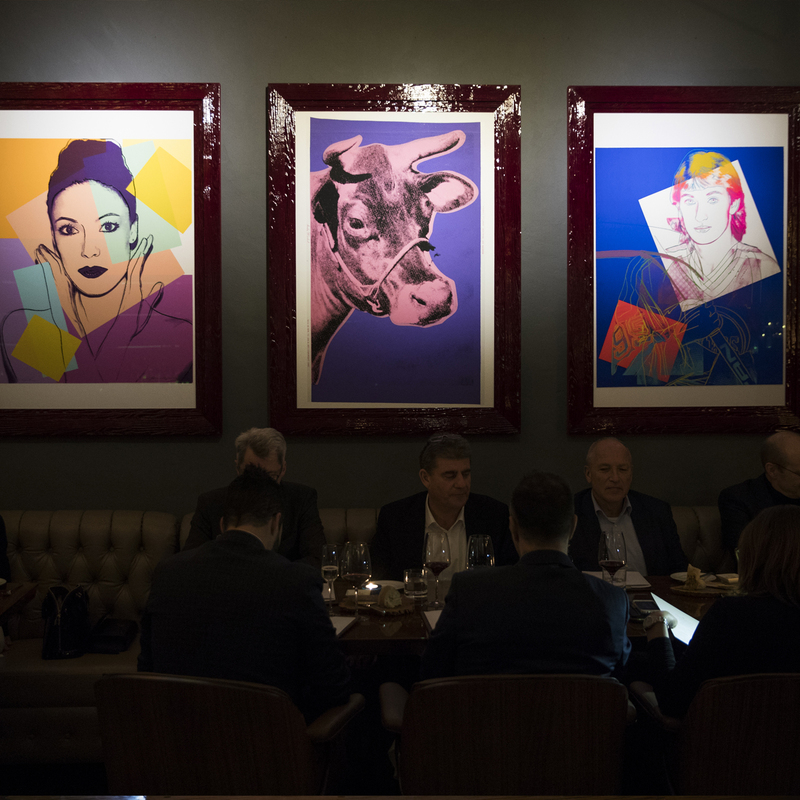 No steakhouse would be complete without a “Cow”, and Pop Art Icon Andy Warhol’s “Cow” adorns the Sitting Room. This work is flanked on the left by Warhol’s depiction of Toronto-native and legendary ballerina Karen Kain who personally signed this print for BlueBlood, making it truly unique. To the right is Ontario-native Wayne Gretzky whose transcendent hockey prowess earned him the title “The Great One”, 1979-1999. These two images were the only Canadian icons ever painted by Warhol. Culminating BlueBlood’s Andy Warhol collection is “Indian Head Nickel” from his “Cowboys & Indians” Portfolio. 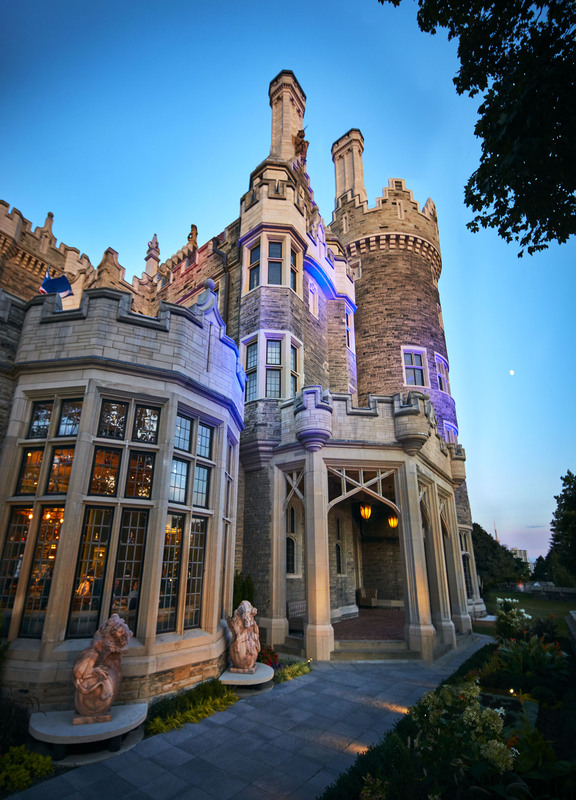 The “Liberty Nickel” echoes sentiments personal to the Liberty Group, both in its name and its 1913 date which marks the year Casa Loma was constructed. Mid 19th to early 20th century archived antiques from Sir Henry and Lady Pellatt’s original collection are prominently displayed in homage to the profound history of life once lived in Casa Loma. Last, but certainly not least… Henry the Moose, presides in silent salute to the original moose head which hung over Casa Loma as seen in the photos from the 1924 estate auction which disbursed Sir Pellatt’s antique artifacts from original collections. Sir Henry Pellatt did not complete many of the amenities planned for the lower level of Casa Loma, but he was able to complete the wine cellar. The cellar was decommissioned during the 1930’s and buried behind walls until March of 2016 when Liberty Entertainment Group discovered it intact behind the walls. It was refurbished to its original grandeur and is now fully functional. 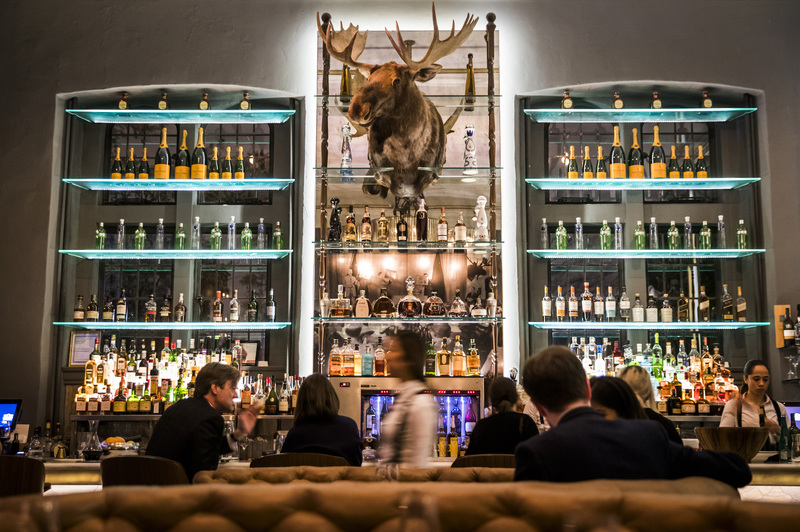 It stands as the oldest wine cellar in Toronto and now houses the award winning wine collection of over 1,500 bottles of the finest wines from around the world for BlueBlood Steakhouse.